Chris Thomale from the University of Heidelberg has written a private international critique of surrogate motherhood (Mietmutterschaft, Mohr Siebeck, 2015, X+ 154 pages). 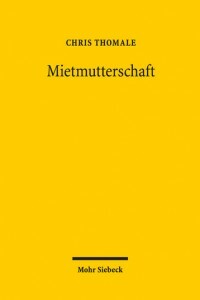 Provocatively entitled “mothers for rent” the book offers a detailed and thorough (German language) analysis of the ethical and legal problems associated with gestational surrogacy. Surrogacy constitutes an intricate ethical controversy, which has been heavily debated for decades now. What is more, there are drastic differences between national surrogacy rules, ranging from a complete ban including criminal sanctions to outright legalisation. Hence, on the one hand, surrogacy constitutes a prime example of system shopping. On the other hand, however, we are not simply dealing with faits accomplis but rather enfants accomplis, i.e. we find it hard to simply undo the gains of system shopping at law as the “gain” levied by the parties is in fact a party herself, the child. In his new book, “Mietmutterschaft – Eine international-privatrechtliche Kritik” (Mohr Siebeck Publishers, 2015), Chris Thomale from the University of Heidelberg, Germany, provides a fully-fledged analysis of surrogacy as a social and legal phenomenon. Starting from an ethical assessment of all parties’ interests (p. 5-18), the treatment of foreign surrogacy arrangements before the courts of a state banning surrogacy is discussed both on a conflict of laws level (p. 19-40) and at the recognition stage with respect to foreign parental orders based on surrogacy contracts (p. 41-52). The essay follows up with investigating the implications of EU citizenship (p. 53-58) and human rights (p. 59-72) for the international legal framework of surrogacy, ensued by a brief sketch of the boundaries of judicial activism in this regard (p. 73-80). Finally, proposals for legislative reform on an international, European and national level are being developed (p. 81-99). Thomale looks at both the empirical medical background of surrogacy and the economic, political and ethical arguments involved. It is from this interdisciplinary basis that he engages the legal questions of international surrogacy in a comparative fashion. His main conclusion is that surrogacy in accordance notably with human rights and recent jurisprudence by the European Court of Human Rights as well as the principle of the superior interest of the child can and should be banned at a national level. At the same time, according to Thomale, national legislators should reform their adoption procedures, building on the well-developed private internatioal law in that field, in order e.g. to offer an adoption perspective also to couples who cannot procreate biologically, such as notably gay couples. In the essay, recent international case-law on surrogacy, including notably Mennesson et Labassée and Paradiso et Campanelli (both ECHR), is discussed in great detail.